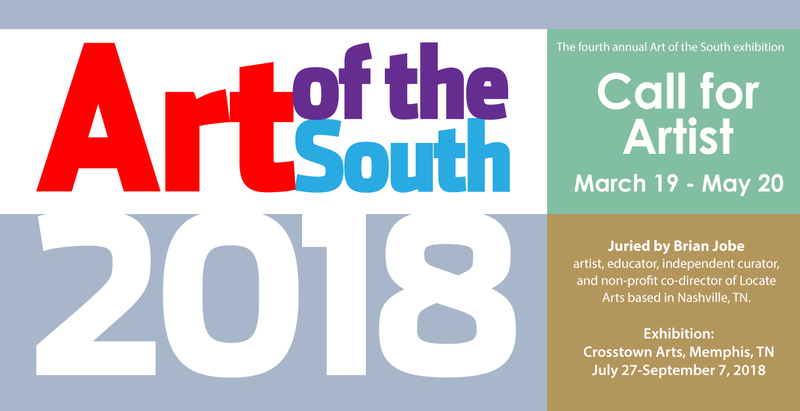 Artists are invited to apply to this year's Art of the South exhibition juried by Brian Jobe, Co-Executive Director of Locate Arts, an organization that connects and promotes contemporary visual art in Tennessee. This year the Number-sponsored exhibition showcases talented southern artists in the newly opened Crosstown Arts space located in Crosstown Concourse. This juried exhibition is open to all artists 18 and older working in any media residing in AL, AR, FL, GA, KY, LA, MD, MO, MS, NC, OK, TN, TX, SC, VA, Washington, D.C., or WV. Entries must be original works created within the last 2 years. Reproductions not allowed. Works previously exhibited at Crosstown Arts are ineligible. Artists may submit up to three images with an entry fee of $35. Accepted works will be exhibited at Crosstown Arts in Memphis, TN July 27–September 2, 2018. Submission GuidelinesAll work must weigh 60 lbs or less and measure no larger than 48” in any direction. Work must be available for the duration of the exhibition. Accepted work must arrive at Crosstown by July 18. Works must arrive exhibition ready, complete with hanging wire. No saw-tooth hangers or clip frames will be accepted. Works that differ significantly from the entry image may be disqualified. Works may be shipped or hand delivered to Crosstown Arts at 1350 Concourse Ave., Suite 280, in Memphis, Tennessee 38104. Those being shipped must use plexi or acrylic, no glass. Work must use a reusable container and be accompanied by a prepaid return-shipping label. Work will be repackaged and shipped back to the artist at the close of the exhibition. Hand delivered works not picked up by the gallery’s designated pick-up date will become the property of Number: Inc. Entry SubmissionSubmissions will only be accepted through our online submission portal until 11:59 PM on May 20, 2018. Only digital files (JPG) at 72 ppi, with the longest side measuring 1200 pixels will be accepted. For video submissions use .mp4 or .mov using the h264 codec with a maximum runtime demo of two minutes. Formal entry file names to include artists first initial, last name, title of artwork, and submission number (i.e., j_doe_myartwork_1.jpg). All submissions must include a completed entry form and entry fee. Entry fees will be collected at the time of submission by credit card or PayPal. You can access the submission portal by using the address below. Artists chosen to participate will receive a loan form to be filled out and sent to Crosstown with their artwork. Crosstown Arts will include chosen works of art under its insurance policy for works of art on view in any/all of its exhibition spaces. Sale of ArtworkCrosstown Arts does not take any commissions from sales of artwork, and is happy to assist in facilitation of sales by accepting buyer information and payment via cash, check, or credit card to be paid to the artist within two weeks of the closing of the show. Credit cards incur a 3% fee paid directly through use of a “Square” credit card reader. There is an additional 2% added to the square charge if the actual card is not present at the time of the transaction. Crosstown Arts will handle of processing of 9.25% TN State sales tax. PublicityNumber: Inc. and Crosstown Arts may use images of artwork accepted into the exhibition for publicity purposes. Artists agree to allow reproduction of their digital files and or photographs taken of their art for educational, publicity and archival purposes. Biography of the JurorBrian Russell Jobe (American, b. 1981) is an artist, educator, independent curator, and non-profit co-director based in Nashville, TN. exhibitions/ projects have been on view at venues such as Mixed Greens Gallery (New York, NY), Blue Star Contemporary Art Museum (San Antonio, TX), the University of Wyoming (Laramie, WY), the University of Tennessee College of Architecture + Design (Knoxville, TN), and the McNay Art Museum (San Antonio, TX). Born in Houston, Texas and raised in Memphis, Tennessee, Jobe received a Bachelor of Fine Arts degree from the University of Tennessee in 2004 and Master of Fine Arts degree from the University of Texas at San Antonio in 2006. After living in Brooklyn, NY for a time, he relocated with his wife, painter Carolyn Jobe, to Tennessee.